SAT test scores, for better or worse, play a critical role in both college admissions and merit scholarships. There is nothing fun about preparing for or taking the SAT, and there are no short cuts to achieving a high score. According to a 2009 New York Times study, family income and SAT test score results have a strong positive correlation (meaning, students from wealthier families do better – read more…) Wealthier families can pay for test prep courses or private coaches that can run thousands of dollars or more. The good news is that there are low-cost SAT test prep options for families on a tight budget. Doing well on the SAT isn’t magic. 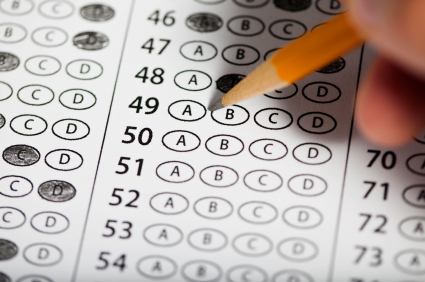 Mastering four key multiple choice test-taking strategies, a targeted review of high school fundamentals in math and English, and taking lots of SAT practice tests can significantly increase your SAT score. This article provides a summary of low-cost options for raising your SAT score. A general overview of the SAT / PSAT / ACT / PLAN tests is available here (part of OneDublin.org’s College Primer for Parents series). The Official SAT Study Guide – Walk into any bookstore and you’ll find entire aisles of SAT prep material. If you only can afford one book, go with the CollegeBoard published study guide that includes 10 prior tests – the CollegeBoard is the organization that authors the SAT. You shouldn’t pay more than $20 (available on Amazon.com here…). Gruber’s SAT Word Master – There are numerous books and flash cards with lists of words to memorize. What makes Gruber’s SAT Word Master interesting is the breakdown of word roots, prefixes and suffices that will help with words not appearing on any list. Khan Academy SAT Prep and math tutorials – The Khan Academy is a terrific free resource that contains thousands of video tutorials on a wide range of topics (math in particular). Establish a baseline SAT score. The CollegeBoard’s free online test (available here…) is one way to establish a baseline SAT score. Set a target SAT score. Using resources like the CollegeBoard’s College Handbook, determine what SAT score is required for target universities (a free alternative is the university websites which list average SAT scores for admitted students). For the math portion: ACE the SAT is an interesting free app that has 200,000 math questions that are randomly chosen to create short SAT-style tests. For the English portion: Princeton Review has two SAT vocab apps available for $4.99 each. Dublin High School offers practice SAT tests several times per year – these are terrific opportunities to take a practice test under conditions close to the real thing (contact Dublin High School Counseling for details). Investing just a bit more opens up cost-effective online and in-class options for SAT prep. Las Positas College offers an SAT Preparation course for $189 (+$30 materials) – the next 4-session course starts in mid-March 2012 (more information available here…). A short SAT course (covering key test taking strategies) combined with intense practice at home (as described above) can be a very effective and inexpensive path to a higher SAT score. Expensive private and group tutoring for SAT prep is not the focus of this article. There are many options including PrepPoint, Revolution Prep, Kaplan, C2 Education and Princeton Review that start at $500 (but typically run >$1000). The benefit of services like these is forced practice, personalized tutoring on problem areas and test taking strategies. If you have the resources, and need to be in a classroom setting to do the work, these courses can be worth the investment. Because SAT tests are offered multiple times each year it is tempting to “wing it” the first time, and then take the test again if necessary. That is a risky strategy because it almost guarantees the first test will be a throwaway result. Instead, make it your goal to achieve your target SAT score on your first test – prepare for the test as though you can’t take it again (and hopefully with hard work, you won’t have to). Thanks; this is a really convenient and helpful article! And a comment on the SAT scores: My mother is a former high school registrar. She says all SAT scores (not PSAT scores) show on your transcript that colleges see. So if you take it more than once, your first and/or lower scores are available for viewing by colleges. So it makes sense to prepare, like outlined in your article, instead of using the test itself as preparation and planning to take it again “for real”.